If polymer chains can intermingle across the interface then you start to get some reasonable degree of adhesion. As we will see in the Hysteresis app, pure intermingling can give ~1N/m. 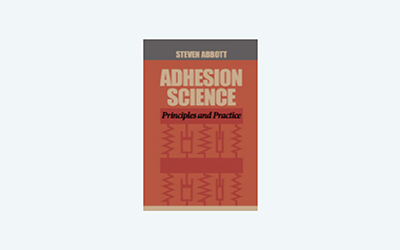 In reality this is often amplified by dissipation to a respectable level of adhesion. 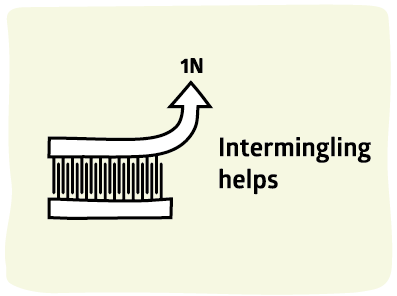 Intermingling is seen by some as part of the "diffusion" mechanism for adhesion and is frequently dismissed "because most polymers are immiscible so cannot form this sort of bond". Although it is (surprisingly) true that most polymers are thermodynamically immiscible (when measured carefully, high MWt PMMA is immiscible with high MWt PEMA!) that is a "bulk miscibility issue". Flory-Huggins theory makes it possible to estimate the abilities for dissimilar chains to intermingle across a boundary and you can easily get a few nm of intermingling - all that's needed to begin to get good adhesion. How do you ensure intermingling? First, you can't intermingle with crystalline surfaces such as PE, PP or PET. That's why you need corona/plasma/flame or excimer lasers or xenon flash to create an amorphous surface. Second you make sure you have reasonable chemical compatibility between the two polymers - and this is best done using Hansen Solubilty Parameters as discussed in Practical Solubility.